Does this sound familiar? You’re a golfer who takes his/her game seriously and hates to lose to friends during a weekend round. You then frequently go home and proceed to tear your hair out over why you missed some of those fairways, did not hit some easy greens, or putted so poorly. Well, you’re not alone. Peter Sanders was another golfer who did just that. He was from the insurance business until he became a golfer. He took the advice of a popular golf magazine and started keeping a record of his statistics for every round of golf played. That is, he kept track of the number of fairways hit, greens-in-regulation, scrambling (holing out in two shots after having missed green-in-regulation), sand saves and putts per round. He soon acquired a very respectable handicap but, in his words, “As a 14 handicap I found that data more depressing than helpful”, mainly because there was no comparative information available for the average golfer other than PGA TOUR information. Overall, says Sanders, traditional golf statistics have many flaws. Which is why he, as someone who had developed computer models to predict the frequency and severity of prospective insurance accounts, figured out something similar for golfers. Some examples of what Sanders considers to be flaws in the traditional way people keep track of performance: A golfer must respond with a mere yes or no to the question of having hit a fairway. How does that help? The severity of the shot is also important. For instance, to hit a drive 275 yards long and be in the first cut of rough might be a far better result than a mere 175 yard, middle-of-the-fairway hit. And both might be better than an out-of-bounds tee shot. Similarly, for the average golfer to keep track of greens hit in regulation is not very helpful, because they can, and do, hit so few of them. Finally, the total number of putts per round is not nearly as important as the distance from which the first putt was made on each hole. So, what did Sanders do to help correct the way he and other golfers could better analyze their performance? 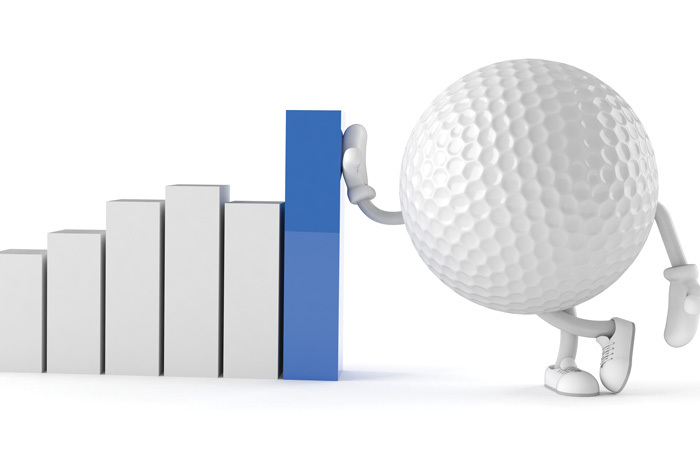 He set up a company called Golf Research Associates LP, where he offers comparative data not just for Tour professionals compared to their peers, but for all skill levels of other golfers too, based on his database of over 350,000 rounds played by various golfers. How does it work? A golfer goes to shotbyshot.com and signs up for a free analysis for a round of golf. If the golfer then buys one of two annual packages, there are many analysis options, once they start inputting, into a cell-phone app, a few items of information after every hole played. Then he or she can either select which specific rounds to analyze, or filter rounds played through a variety of options. The program also gives players concrete recommendations and does not just expect someone to just receive a set of numbers with no plan of action for improvement. For instance, if a golfer has an existing handicap as well as a target handicap, what would be the single most important aspect of their game (of driving, approach, short game or putting) to improve to get there? Which part of their games would save them the most shots? Each area of a golfer’s game is assigned a “relative handicap” which demonstrates a golfer’s ability in one aspect of the game only. So, while a golfer could have a real handicap of 15, their relative handicap for putting could be 10, meaning that they putt very well compared to the rest of their game. If someone has a tee-to-green relative handicap of 9, but a driving handicap of 17, then clearly the latter needs more work. Of course, the work required is not merely based on making the fairway, but on the relative severity of the miss. The best part of the ShotByShot analysis? It has options to compare a golfer with him- or herself instead of to some nebulous, ever-changing field. After all, who cares how Tour players perform on some course that regular golfers may never play on while competing against a different field every year?